There's been quite a bit of buzz lately about a new investing and brokerage account through a website called Betterment.com. A lot of personal finance blogs are writing about it because it takes a topic that can be confusing for a lot of people, and makes it accessible. They take the investing process and make it as simple as 1-2-3. Sign up, fund and invest. Ok, let's back up for just a moment. At it’s very core it’s just another of the online brokerages that we hear about all the time on this site and others. They allow you to hold stocks and bonds as investments via ETFs, like an account through Scottrade or ShareBuilder. But it’s more than just a brokerage account. It’s also a tool that helps automate the investing process, to make it simpler for the average Joe. You can set up automatic investments every month, and it will also automatically re-allocate your investments for you on a regular basis. In essence it's a set it and forget it investing solution. I recently signed up for Betterment to give it a run-through, and today I thought I'd do a quick review of Betterment.com. Simple Investing? How Simple Can It Get? Betterment.com was founded back in 2008 by Jon Stein. While it was founded back in 2008, Betterment.com only recently launched at TechCrunch Disrupt 2010 NYC. In December 2010 Betterment.com received $3 Million in a series A financing round from Bessemer Venture Partners (lead) and Anthemis Group. Betterment LLC is a Registered Investment Advisor with the SEC and they’re SIPC insured. You can be assured of the same protections as you would with a larger financial institution. Of course since this is an investing account and not a savings account, there is no assurance of not losing your money. Betterment only launched a few months ago, but because they've got such an innovative concept, it's receiving a ton of buzz. They've received writeups in The New York Times, CNNMoney, Investment News, Mint.com and more. While Betterment has only been around since the end of last year, they've already started garnering a ton of attention, and a few awards for their trouble. So while they have just launched folks are already starting to recognize them and their concept as a powerful one. How much of your investment you want in equities (Stock Market). 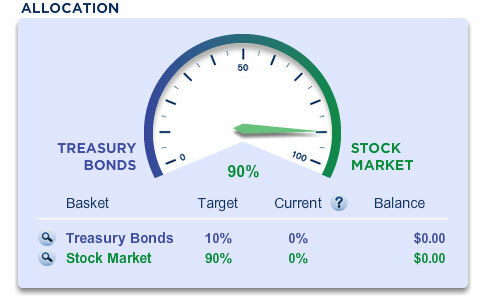 How much you want in Treasury bonds (TIPs). You can also set up automatic investments on a regular basis if you want to. So the stocks and bonds you get will give you a nice diversified portfolio that will for the most part track index performance across various sectors. One of the cool things in the Betterment account are the allocation and visualization tools that they have available. The tools make it easy for the average investor to see what kind of returns they might see (given historical returns) if they invest with a 5, 10, 20 or even 30 year time horizon. Once you come up with an allocation and time horizon that you are comfortable with, just hit the button to change your allocation, and within a few days your changes are made! Check out their online demo here: (demo). Let’s say that you have about $50,000 invested as the demo account does. 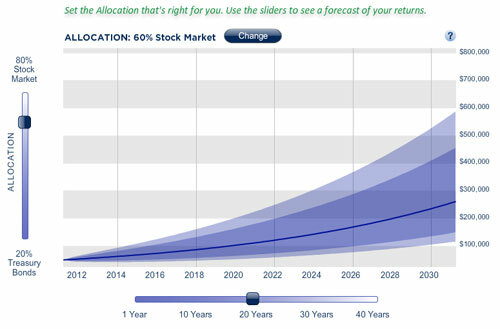 If you have 80% invested in stocks and 20% in bonds, given a 20 year time horizon it will show you a forecasted range of returns that you could expect to see – anywhere from $100,000-$600,000. Change the percentages and time-line and it can drastically affect your results. It's interesting to look at just how drastically things can changed based on the decisions you make. So if you decide you want to change your allocation either to include more stocks or bonds, you just move the slider up or down, and then hit the “change” button, and Betterment will update your account holdings and purchasing decisions going forward. One thing that often happens with traditional retirement accounts is that the account owner neglects to ever update his or her portfolio on a regular basis, and in the end their allocations get all out of whack. One of the nice things about an account with Betterment is that you never have to re-allocate your money. It will automatically re-balance your portfolio for you every three months, or if your allocations ever drift more than 5% before that. Without re-balancing your account can easily shift over time to have an allocation that is heavier on stocks or bonds than you want it to be. If you start out at say 90/10 stocks to bonds, if you don’t reallocate over time you could one day find that your account has an allocation more like 80/20 or 85/15. This is one of those things that most investors neglect to do on a regular basis, so it’s nice to have that part of the account be automatic. What kind of fees can you expect to pay for using Betterment Well first off, there are no minimums to invest, and there are no fees for trades. The only fee Betterment charges is a pro-rated yearly fee that is in a range of 0.15% to 0.35%, depending on your account balance. For most beginning investors it will come out to .35% annually. For starter accounts with a minimum balance of $0 and $100/month minimum deposit, you'll have a .35% annual fee. Minimum balance of $10,000? You'll get next day transfers and a .25% annual fee. Minimum balance of $100,000? You'll get next day transfers and custom portfolio options along with a low .15% annual fee. For an account where you'll be having someone manage your investments for you, re-allocating their portfolio every so often, and not having to worry about ever paying any other fees or charges for making trades – these are some pretty reasonable fees. It makes the account a winner. I think it definitely makes sense for most people. While I did have some reservations about the site back when they launched, I went ahead and signed up for Betterment.com. I'm gonna try it out for a while. One of the great things about the account is that it's more like a traditional bank account in that getting your money in and out of the account is as simple as withdrawing it. No fees associated with making trades. The only risk you take is the same risk that any investment in equities has. Add to that they've got a account signup bonus now as well, and you've got nothing to lose. So why not try it out? Personally I just really love the idea of making investing that much more simple as it will make it more accessible for a ton of other folks. So we'll see how it goes – I'll probably report back in a while to give a rundown of what I think of the site after I've actually been investing – and playing with their tools for a couple of months. Get a bonus when you open your Betterment account. Click here. Thanks so much for giving us a try. Definitely let us know how it goes or if there are other opportunities to make investing more accessible – we are always trying to improve. Hi, I just came across your blog today after being recommended Betterment over at Mint.com. How is it working out for you, are you still using the service? Thanks in advance! Thanks for the comment. As I posted in response to you a few other blogs, you are correct, there is a fee that would be assessed should a 3rd party direct transfer be requested. This is because it would involve a 3rd party to complete the action – it is not a feature provided with your account. Betterment will NOT charge any transaction fees to allow you to complete an indirect transfer of your account, and is our recommended method. While we apologize that the new brokerage may charge fees for the trades of moving funds into your account as cash, we do our best to provide an option that does not cost anything extra. Next Post: Can Identifying With Your Future Self Get You To Save More For Retirement?